JUST BREATHE A method that tracks harbor porpoises' breathing helped scientists verify claims of high energy needs in the free-swimming mammals. By counting harbor porpoise breaths, researchers have come up with a new way to judge the animals' hard-to-measure metabolism. The trick shows that the animals can burn energy more than twice as fast as humans. Researchers analyzed the several thousand puff-huff respiratory sounds recorded per day from each of 13 harbor porpoises swimming freely in Danish waters. Including just everyday staying-alive body processes plus hunting and other activities, the animals' average total energy use ranged from 7.8 to 31 megajoules per day, researchers report December 6 in the Journal of Experimental Biology. The five adult porpoises (Phocoena phocoena) studied averaged 21.7 megajoules per day. A typical human weighing about as much as a full-grown porpoise, however, needs only about seven to nine megajoules of energy daily, says study coauthor Peter Teglberg Madsen, an eco-physiologist at Aarhus University in Denmark. Madsen says the animals' high energy needs in the chilly waters close to Danish shores leave him "somewhat worried." Harbor porpoises there depend on small fish, even down to pinkie finger-sized ones. But to survive with such a high metabolic rate on small prey demands steady hunting. And Madsen fears that increasing human disruptions in the ocean are making that difficult for the ocean mammals (SN: 2/13/18). Metabolic rates of marine mammals "are certainly more than an abstract scientific question," says marine biologist Andrew Read, who directs the Duke University Marine Lab in Beaufort, N.C., and was not involved in the project. Advocates of culling marine mammals believed to compete with human fisheries often cite the animals' revved-up metabolisms and voracious hunting habits to support their point, he says. But figuring out how much food a free-swimming mammal really needs to sustain its metabolism is hard. That's where the breaths come in. As an animal fuels its basic body processes and daily activities, it consumes oxygen and produces carbon dioxide. For small land animals, researchers have devised lab setups to measure gas fluctuations in breath and blood, but that's tricky for big sea animals. In the past, researchers have used data on land mammals to speculate about their counterparts in the sea. But the few actual measurements of these gas fluctuations in young porpoises in captivity have suggested their metabolic rates are higher than similarly sized land mammals. Captivity, however, might be stressing the animals and driving up their rates. So Madsen and his colleagues wondered if porpoise breathing rate, something people can reliably count in free-swimming mammals, might give clues to the animals' total daily energy needs, called the field metabolic rate. 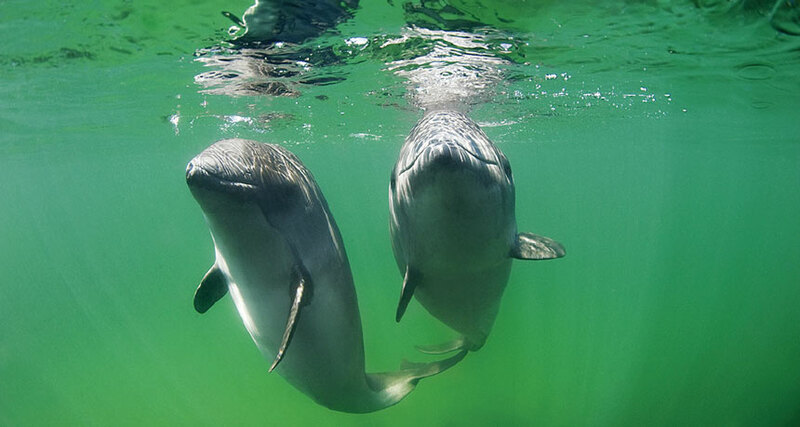 To connect breaths with energy use, study coauthor Laia Rojano-Doñate, also at Aarhus, turned to three captive porpoises kept in a net pen in a fjord, where the animals experienced natural ocean temperatures, salinity and water movements.